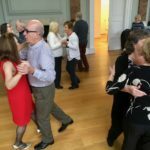 The February edition of Tea and Dance Lessons in the Court House Ballroom, held on Tuesday 5th, had some first-time guests and the beautiful oak floor was filled with dancing couples. 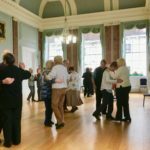 The combination of professional teaching, enjoyable ballroom dancing, tea, cake and good company is proving more and more popular. Here are a few pictures. Click on each one to see it full-size. 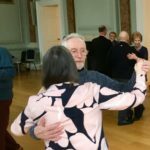 The Tea and Dance Lessons are held on the first Tuesday of every month from 2pm to 4pm in the restored Regency ballroom on the first floor of the Jury Street Court House. It costs just £2.50 to take part, including the tea, coffee and some fine cake in the interval. You don’t need any experience. The teachers from Majestic Dance are happy to give individual coaching if you’re not sure of the steps. You don’t even need to come with a partner. 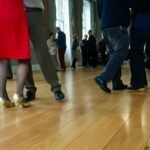 Just team up with someone else and take the floor for some ballroom classics, such as the social foxtrot and the waltz. 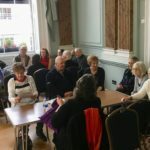 These enjoyable social afternoons are organised by Unlocking Warwick for the Town Council. 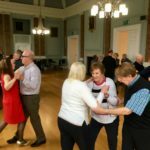 Why not come along to the next edition on Tuesday March 5th, or suggest it to someone who might particularly enjoy the ballroom music, a little gentle exercise, and a nice tea in a friendly atmosphere. there’s no need to book. Just turn up for a 2pm start.